100 BOOTS: The Lost Picture Show opens on February 24th, 2017 (6 - 8 pm) and runs through April 9th at Alden Projects™. This exhibition presents recently discovered vintage photographs by Eleanor Antin from her personal collection, expanding our understanding of the peripatetic adventures of her most celebrated series, 100 BOOTS (1971-73). 100 BOOTS is a travelogue, along the lines of Huckleberry Finn or Jack Kerouac’s On the Road, featuring the cross-country adventures of 100 stage-photographed rubber boots—Army-Navy surplus boots. They are a unitary protagonist in an allegorical narrative that a then-contemporary audience easily connected with the Nixon era and Vietnam War. The work earned its initial underground reputation as a series of 51 components that were sent through the mail over a two-and-a-half year span, to between 600-1000 recipients, bypassing the conventions of reception and distribution. All of the postcards are accompanied by plot-driving titles, dates, and shooting locations, all printed verso. Bringing the war home in such a direct manner, 100 BOOTS was celebrated for its canny circumvention of the conventions of unique artworks well before the Museum of Modern Art invited Antin to exhibit there in 1973. What is not widely recalled are the specifics of Antin’s multi-component MoMA installation of 100 BOOTS, which included three distinct sections. The largest in the North West Gallery was Crash Pad for 100 BOOTS (1973), an installation comprising a room-within-a-room, described in the museum’s exhibition materials as “a tenement apartment for the boots”…“complete with mattresses, sleeping bags, radio, and a front door equipped with a peep-hole and a chain lock.” (Crash Pad for 100 Boots is presently in LACMA’s collection). Hanging in the Far West Gallery were the better-remembered 50 postcards (the final, 51st card captioned “100 Boots Go on Vacation,” was sent from California after the show closed). Also notably present were more than two dozen photographs of the “BOOTS adventures in New York” all of which are not otherwise pictured as postcards. The dimensions of the “photograph panels” are listed on the typewritten Checklist as “each approximately 20 x 16 in” (but also corrected by hand to read “each approximately 8 1/8 x 12 in”). And so this exhibition sets out to clarify that the work we thought we knew so well—what the artist call’s “my fur tea cup”—extends beyond the four corners of the postcards. 100 BOOTS: The Lost Picture Show, curated by Alden Projects™ in collaboration with Eleanor Antin, brings to light “lost” and mostly unknown pictures of the boots in California and New York, most approximately the same range of scale as listed above. On view at Alden Projects™ are photo panels and vintage printed, gelatin silver prints, “showing the BOOTS adventures in New York”. 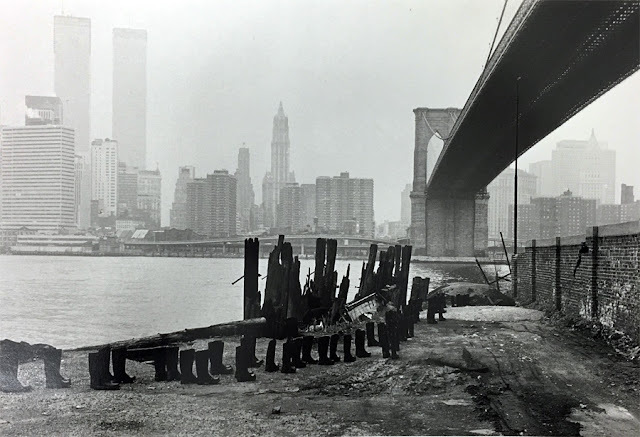 (See below, 100 BOOTS Under the Brooklyn Bridge .) Additionally, a number of arresting scenes of the boots in California, also previously unknown, are also present. 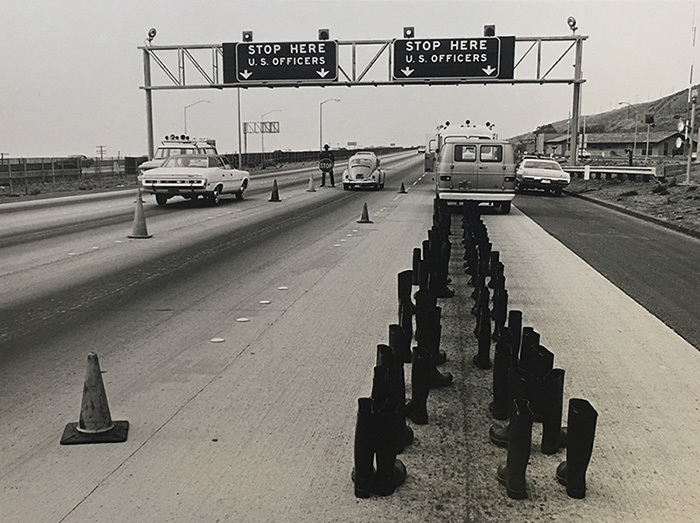 Notable among them is the cabinet-sized picture, 100 BOOTS at the Checkpoint, San Onofre (1972), depicting 100 BOOTS stage-photographed at an American immigration checkpoint near the Mexican border (and requiring considerable bureaucratic effort on the part of the artist to realize). In this picture, as elsewhere, Antin’s works are uncanny allegories of discomforting times, strangely familiar to our own. Standing together, we are reminded again that when sorrows come, they come not in single spies, but in battalions. Alden Projects™ is grateful to the artist for the opportunity to work collaboratively on this special exhibition as well as to Ronald Feldman, the artist’s legendary, long-time dealer. 100 BOOTS is my fur cup. Think of the surrealist artist, Meret Oppenheim, and that strange, disorienting fur cup comes to mind. Many people react to 100 BOOTS like that. As Yvonne Rainer once said many years ago, oh, Eleanor Antin, she does boots. Happily, after half a century in the art world, most people are aware of my other works, many people even prefer some of my other works. Sometimes I do too. But I luv 100 BOOTS. He changed my life though it took me 2 1/2 years to realize fully who he was. He was becoming my female version of Kerouac's "On the Road". Two travel narratives, one bad boy literary, the other a leisurely visual odyssey from a respectable American town into a more dramatic, wilder, more dangerous place. Somehow the images that didn't make it into the final piece were too dramatic, too overtly political, too suggestive of other meanings. So they remained photo prints, not postcards, and stored away in my studio where I forgot them for 50 years. Among them were images from their NY adventure when they moved into MOMA and which were shown at the museum in 1973 and never shown again. I vaguely remember some other MoMA prints but I never found them. Besides, after MoMA, I went on a hunger strike for my new piece "CARVING: A Traditional Sculpture". I was moving on. But when Todd Alden visited my studio in San Diego and told me how much he loved 100 BOOTS, my assistant Pam rummaged around into my deepest drawers and discovered those old photo prints sleeping way in the back. We were surprised. 50 years old and they look so contemporary and yet also suggestive of another time. Many of them have an angst that frankly looks uncomfortably like today. See 100 BOOTS Head East, The Museum of Modern Art Press Release No. 41, May 30, 1973 and Checklist for Projects: 100 BOOTS by Eleanor Antin (May 30 – July 8, 1973), The Museum of Modern Art Exhibition 1035 Master Checklist.